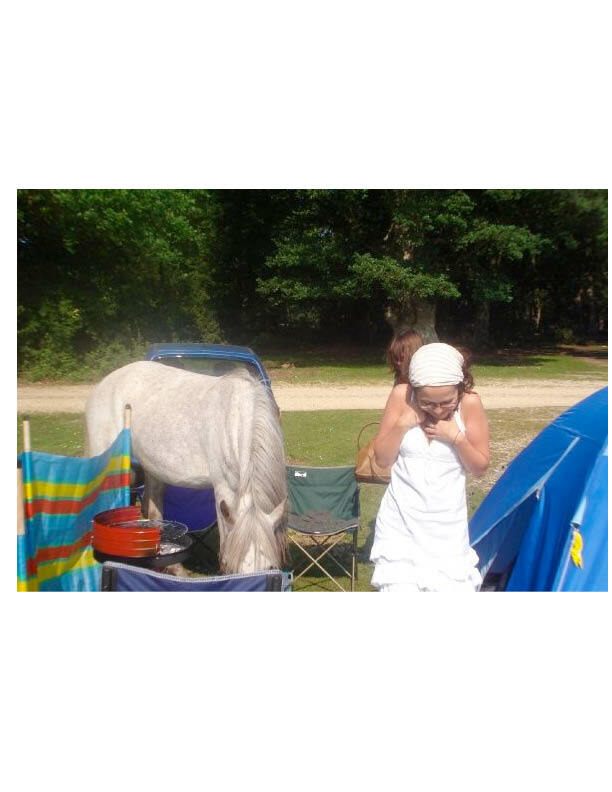 A few years ago, my friend Fiona and decided to take another friend – Jess – camping in the New Forest as a present for a big(ish) birthday. I know what you’re thinking, perhaps a weekend in a spa or a luxury resort might have been more appropriate? But what we wanted was to take her on holiday, and this was the one that our budgets allowed. So on the Friday afternoon, we bundled Jess into the car without telling her where we were going and headed off to the forest. With various pit stops for supplies and perhaps one or two wrong turns, it was beginning to get dark by the time we turned up at the campsite. The girls stayed in the car while I went to check in at reception. The park ranger on duty was friendly and enthusiastic, and charmed me with unlikely tales of the dangers of burning wood and of ponies invading tents in which food was left. Honestly, I thought, what kind of a tourist did he take me for? 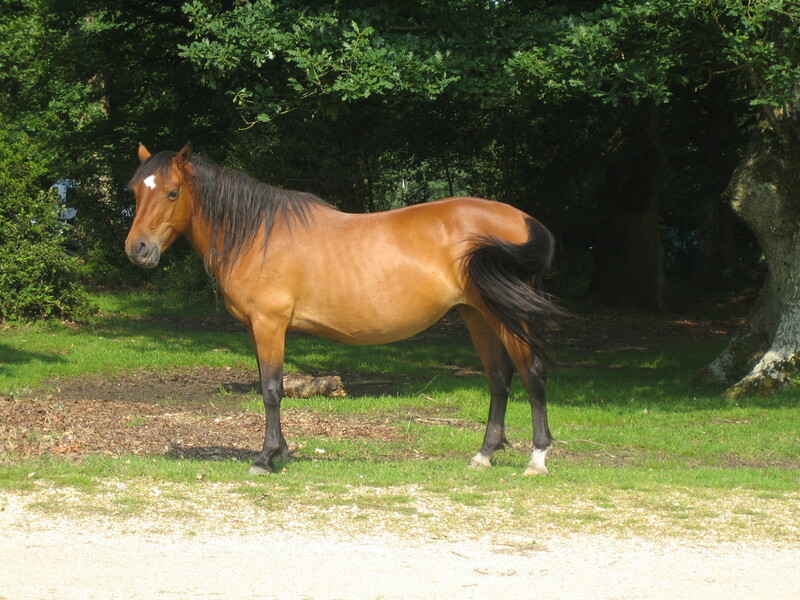 This was the New Forest, not Yellowstone Park! Still, I didn’t want to rubbish his job, so I smiled indulgently, and then skipped off to rejoin the girls and select somewhere to pitch the tent. Not wanting to subject the birthday girl to too much manual labour, Fi and I set to work on the tent, giving Jess what we imagined was the easy job of assembling the barbecue. Half an hour later, Jess was peering at a weighty instruction booklet by the light of her mobile phone, while scattered pieces of complex equipment gathered dew around her. Meanwhile, Fi and I, having sneeringly dispatched a group of young South African men offering help, had to go crawling back to beg a torch . . . and a mallet . . . and, well, another pair of hands. Finally, starving and chilled, we gathered around the assembled barbecue and admired our reasonably-sturdy looking tent. Now for dinner! I looked doubtfully at the burn-in-the-bag charcoal that Fi had bought – having learned from bitter experience that sometimes only the most flammable firelighters will do the trick. Needless to say, this was one of those times. We tried everything – every match and lighter in our possession, twigs and leaves from the forest floor around us, blowing on the feeble flame, talking to it, singing to it. In desperation, Jess dragged forth her bag, proposing ever wilder methods of flame-generation. Deodorant! Hair spray! This T-shirt! This pair of brand new, never-worn polyester knickers! We looked at each other. The knickers were flung onto the barbecue and in a matter of seconds the flame was roaring. 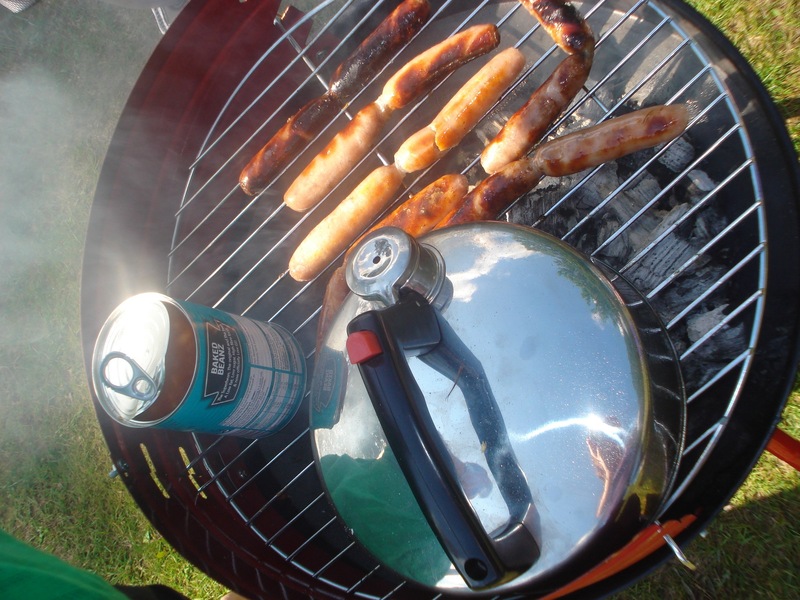 Instantly warmer, we cheered, embraced, and began to bring out sausages and bacon. Suddenly an interrogation-strength torchlight shone directly into our eyes. Squinting, I could just about make out the shape of my friendly park ranger. Genuinely confused, I held a packet of Sainsbury’s Cumberland sausages out, appeasingly. Oh-ho! I see! Well, no doubt the smell of burning polyester was pretty alarming if you weren’t prepared for it, not to mention drunk on hunger. I opened my mouth to explain, smiling cruelly at the thought of his impending humiliation. But Jess beat me to it. ‘Twigs!’ she squeaked. I confess I didn’t hear much of the ensuing lecture – the gist was that if he weren’t such a nice guy he’d call the police and we could face a £10,000 fine – I was distracted by trying to keep my own temper under control (I do not like being told off), while keeping a weather eye on a familiar ‘Downtown to Chinatown’ lip-curl on Fi’s face. Meanwhile, just as Jess had been willing to sacrifice her knickers for the greater good (dinner), so she now flung herself on the flames of the park ranger’s rage. Eventually he left us, but not before insisting that we put out the fire in front of him. I mean, really, there was no bringing that wood back, he might at least have allowed Jess’ knickers not to go in vain! 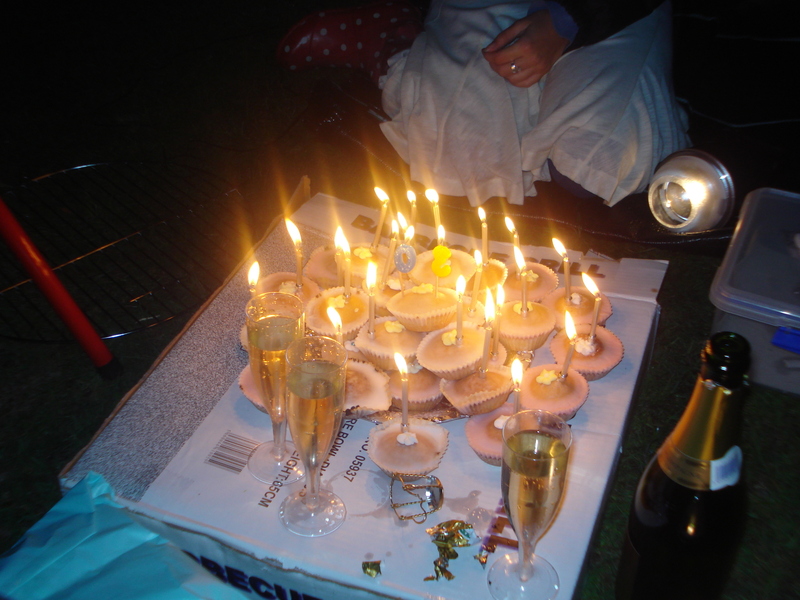 There was nothing for it, but to eat Jess’ birthday fairy cakes, washed down with champagne, while cursing park rangers and burn-in-the-bag charcoal the world over. The next day was much less eventful. Fi had gone out at first light to divest the nearby village shops of their supply of firelighters and we’d had an enormous breakfast, followed by some gentle strolling, but rather more birthday drinking and lying in the sun. We’d seen some wild ponies cantering in a picturesque manner in the distance, but nothing more, and had scornfully added this to the growing list of ‘Reasons the Park Ranger is Rubbish’. On Sunday morning, we’d just finished another substantial breakfast and were lazily enjoying third cups of tea and contemplating the unappealing packing job ahead, when we suddenly noticed a kerfuffle at a nearby tent. 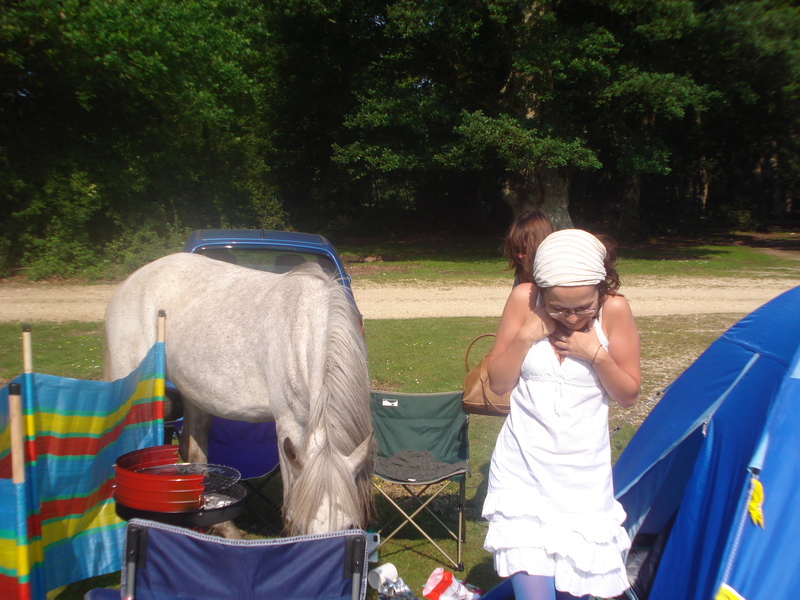 Looking up, we saw that a beautiful white pony was nosing around (literally) in said tent. We laughed along with the owners, who seemed to have everything under control, judging by the confident way in which they manhandled the pony back outside. But then we looked around. And it was a bit like that moment in Jurassic Park when they suddenly realise they are totally surrounded by velociraptors. As many as five ponies, all different colours, were trampling through our immediate vicinity. Before we knew it, the ringleader was stomping over our teacups, sampling a few leftover baked beans and inspecting the inside of our tent. He seemed impervious to our suggestions that he ‘shoo’. They were gone just as suddenly as they had arrived (I suppose the best of us need a lie-down after a breakfast like that), but leaving a trail of destruction the raptors would have been in awe of. All in all, Fi and I can’t claim to have returned Jess to London in a haze of wellbeing and serenity, ready for her birthday celebrations. But she was the proud owner of a whole new skill set, including Barbecue Assembly, Emergency Firelighting, Park Ranger Relations and Post-pony Reconstruction. And, as we have often told her since, she could scarcely have expected as many adventures if we’d taken her on safari. What good friends we are!